A new section on Native America 4-H History has been added to the National 4-H History Preservation website. It is located in the National 4-H History section at: http://4-HHistoryPresevation.com The section includes a number of feature stories out of National 4-H News. The story with the above title was in the June 1943 issue… during World War II, over 70 years ago. “One fourth of the 52,000 youth enrolled Oklahoma 4-H clubs in 1943, according to State Leader Paul G. Adams, are Indian youth. Some of the finest state winners Oklahoma has sent to the National 4-H Congress have been of Indian descent, he adds. “Win the war now, smoke the peace pipe later,” is the slogan of 4-H Indians in the Sooner State. “According to county agent L. I. Bennett, they’re the hardest fighting group of warriors in the country. All members of the Indian Riverside 4-H Club — the largest all-Indian 4-H Club in the state — with their 4-H club projects, they’re helping Uncle Sam furnish food to the boys on the firing lines. They have a keen interest in seeing that food gets to the front because 18 Club members of their fellow tribesmen have joined the Army, Navy or Marines since Pearl Harbor. “You’ll never find a more patriotic group of young people than these 4-H club Indians,” contends Bennett. As the older boys join the armed forces their projects have been taken over by younger members of the club and carried to completion. The girls can foods produced in the club’s Victory gardens. “In addition to growing food, members of the Riverside Club are just as active in other 4-H project areas. At the State Round-Up Andew Pahmahmie placed in the blue ribbon class in the State 4-H Style Dress Revue contest. Bernice Paddlety and Alva Mae Tapedo won a gold medal with their dairy demonstration at the State contest, Ruth Sardongei and Alva Walker won trips to the American Royal at Kansas City for placing first with their paint demonstration, and Luke Tainpeah and Tom Kauley were blue ribbon winners in the poultry demonstration contest. At the Caddo County Fair 53 of the clubs girls made exhibits, winning a total of 82 ribbons. 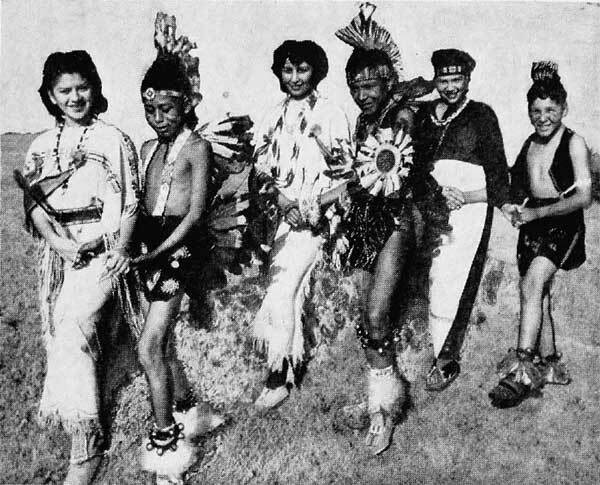 This entry was posted in History and tagged 4-H History, Native American, Native American 4-H Clubs by Larry Krug. Bookmark the permalink.